Versatility is something we’re all looking for in our wardrobes – pieces that effortlessly traverse the full spectrum of whatever our days may involve. And I know that many readers of this blog work both in and outside the home, either full or part time, many of us juggling all that with the kids and other family responsibilities. I also know many of us are looking for wardrobe winners that work across both scenarios. Well, do I have something rather fabulous for you in the latest edition of Styled Three Ways (I’ve upped it to Four Ways just for today): the Three Way Black Linen Jacket, $155 from Elk Accessories. This cleverly designed jacket seriously packs a style punch as well as being an incredibly versatile piece, or rather pieces, of clothing. Yes, this rayon, cotton and linen jacket earns it’s spot in any wardrobe. That’s because it can be worn as a cropped jacket, a long jacket, a skirt and even as a dress, as you’ll see on me in the photos below. 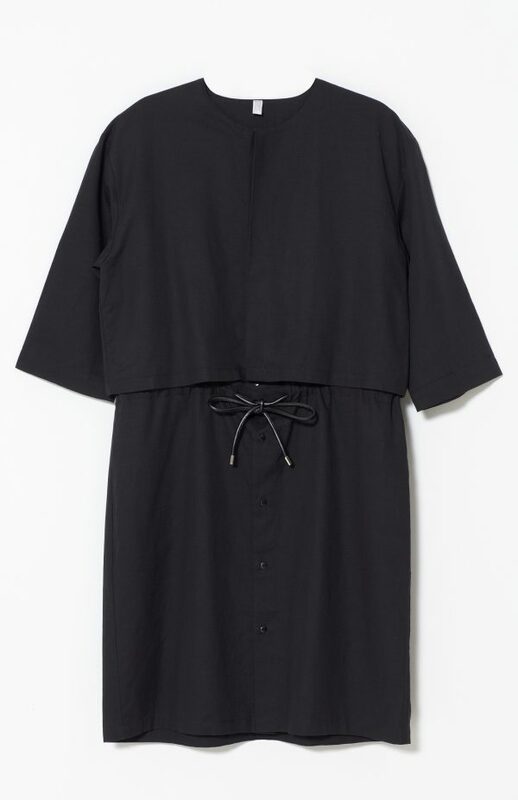 To create these different pieces, all you need to do is button or unbutton and use the drawstring. So that’s effectively a four for one deal. 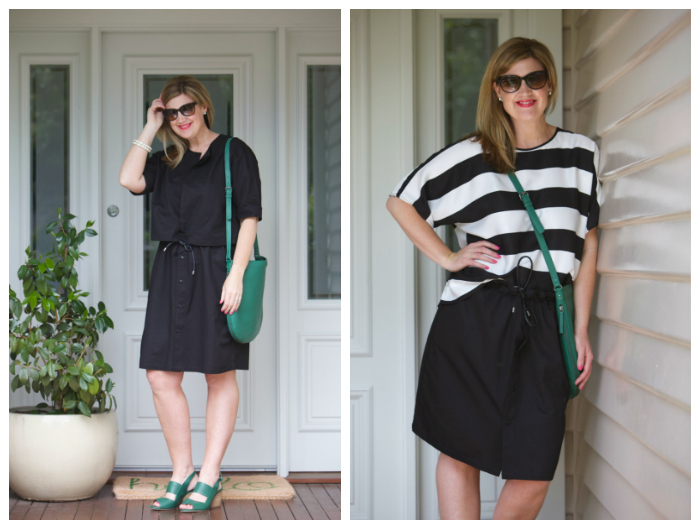 Well, in today’s post, I’m styling this piece four ways to show you how it works. I reckon this is a great piece for work, play and all those in between do’s too. Just a bit of housekeeping before I launch in – I’m wearing the Medium/Large and it’s quite loose and roomy which I like. The drawstring pulls in to create shape though if that’s your preference. It’s also available in Small/Medium. In terms of care, dry cleaning is preferred for optimal results but if necessary, cool hand wash.
Alllrighty then, as SATC’s Trey would say. Firstly, I’m wearing the jacket as a dress. I’ve buttoned up the length and used the drawstring to create some shape but other than that, I’ve literally just thrown it on. This is such an easy but smart option for work, lunch or dinner – all you need to do is change up the shoes and accessories to create different looks. Here, I’ve gone for some striking but complementary accessories – these stunning and uber comfy Ta Wedges in Sea Green; a Nors Large Leather bag in the same Sea Green leather; and simple Geometric Stud Earrings and Geometric Wooden Bracelets. I love that these heels are a decent height with their Scandi inspired stacked wedge heel but they’re still comfortable. Handmade using cow leather and a super soft goat leather lining, they really are a functional fashion work shoe. You might also like to know they also come in marigold and black. You’re welcome. How stunning is this beautiful Nors bag? It’s made from soft leather and is a lovely statement piece. On the practical side, I love a messenger bag so I’m hands free and the weight is distributed evenly. This is especially important when you’re walking a reasonable distance or carrying a lot in your bag. The pop of sea green is stunning too – a bit different from the usual Summer offerings – and the perfect foil with monochrome clothing and accessories. I’m not wearing a top underneath but you could easily add a camisole or light knit for extra warmth or interest too. Next up, I’m wearing the jacket as a long jacket by unbuttoning the front of the garment. I’ve added these beautiful Draped Wide Leg Pants, in black in size 12 (they’re also available in navy and in sizes 8 – 16), and this stunning Square Neck Tank Top in Sea Green, 12 (available XS to XL), made from a lovely silky viscose. These pants are so beautiful to wear. They are a loose, relaxed fit and drape beautifully. They feature side pockets (YAY) and an elasticated drawstring so you can wear these pants high waisted or on the hip. I’ve gone with high waisted and flats (current season Reim flats by Elk too) but they’d also work with wedges to add a bit of height. In the next outfit, I’ve unbuttoned the top of the jacket from the bottom, creating a separate skirt and crop jacket. I’ve added this super flattering and easy wearing striped Loose Fit Top in Large (it’s also available in marigold/viola, black and marigold). The silkiness and flow of the top with the linen blend of the skirt ticks the textural interest box for me. The elbow length drop sleeve keeps things relaxed but still smart – I’ve gone the half tuck with the skirt here but I’d also wear this top with shorts, skinny jeans or with wide legged pants. Meanwhile, the sea green shoes and bag add some colour without sacrificing practicality. Add a bright lip and you’ve got a stylish, comfortable work or smart casual outfit. The skirt without the drawstring is quite big so it’s just a matter of pulling the drawstring to your desired size. Given this is fully adjustable, this is a great piece if you’re pregnant, your weight fluctuates or you like to vary how high you wear your skirt too. In the final outfit, I’m wearing the top half of the jacket as a cropped jacket. I’ve paired it with this awesome Denim Dress, which I’m wearing in size medium. I love having a cropped jacket to wear with sleeveless dresses on warm days that start or end with cool temps. The elbow length sleeve provides just that extra bit of coverage for air conditioned offices too. As for this denim dress, I’m a BIG fan. It’s designed with tidy straps that are wide enough to cover your bra straps while the drawstring clinches in the waist and gives a flattering shape to the overall look. The front pockets are a feature with their bordered edges not to mention practical. In terms of footwear, I’m wearing the Ta wedges but I’d also dress it down with sneakers, Rollies or sandals. For example, I wore this dress casually last week – see me here on Insta – for my youngest son’s first transition to school. It was smart without being too dressy and I felt fab in it all day. A big thank you to Elk Accessories for gifting me all of the pieces above, except for the Reim sandals, which I’d already bought. Check out more of their awesome new Spring Summer range here. For more information about my Disclosure Policy, click here. Do you need a piece like this in your wardrobe? Are you a fan of Elk Accessories? What’s your favourite look?